EDXRF | XRF for Metals & Alloys - Applied Rigaku Technologies, Inc.
Metal alloys are materials made of two or more metals, or of a metal and another material; therefore, mechanical properties like hardness and strength are attributed to a precise composition or stoichiometry. Chemical analysis is typically used as a basis for classifying metal and alloys, controlling their production processes, or verifying their designation. 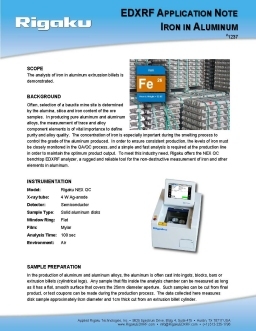 Energy Dispersive X-ray Fluorescence (EDXRF) is routine used to identify and classify metals and alloys.